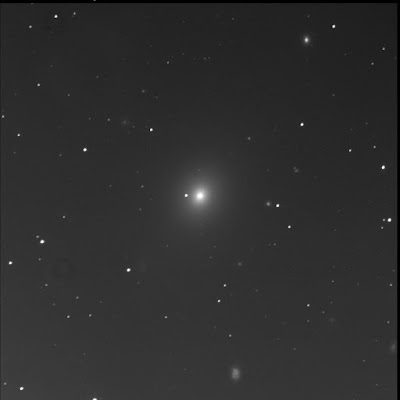 The Burke-Gaffney Observatory imaged M49, a big galaxy in the constellation Virgo. One of the Messier objects I had logged but once (back in early May 2013). I wanted to return for another look. 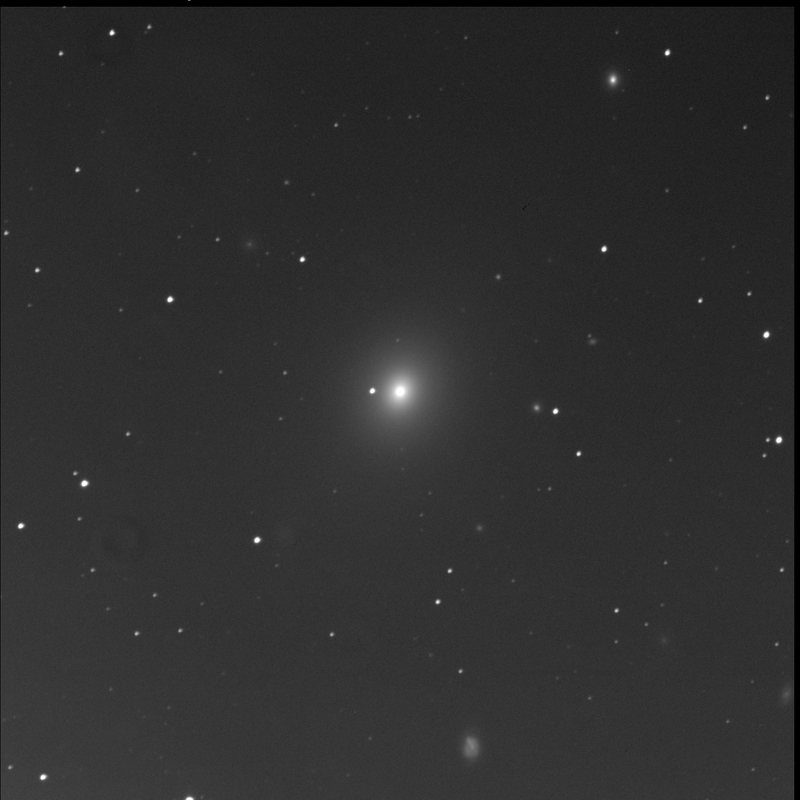 Messier 49 aka NGC 4472 and Arp 134 is a smooth uniform elliptical. Blinding bright core. What would it be like on a world there with such a bright galactic core?! Surely the night sky would be very bright... The large galaxy is oriented south-east to north-west. The outer limits of the canted galaxy extend further out than what I can show in this image. I still struggle with Liberator and drawing out faint details. There are many little neighbouring and distant background galaxies in this simple image. I missed it given the star-like appearance but SkyTools 3 Professional noted NGC 4464 to the north-west, near the top-right corner of the digital image. On closer examination, it is a compact almond-shape with a bright core, oriented north-south. Between is the perfectly round fuzz ball of PCG 41180. To the west-north-west there appears to be a double galaxy, two faint tight objects, with a dimmer one to the north. ST3P only marks the lower object: NGC 4465. Due west of the big galaxy, is the medium-bright round galaxy of NGC 4467. It is just east of a star making for a good comparison of faint fuzzy and blotted star. South-west, about the same distance from the core as 4467, but fainter, is PCG 41185. Further out is the very faint LEDA 1333286. And still further out is a large spiral, just at the edge of the frame, at the bottom-right. That's MCG 1-32-76. Curious NGC 4470 is nearly south, an amorphous mottled blob. It looks like a spiral that's been smashed (previously seen). The big, round, uniform, but extremely faint MCG 1-32-84 shows to the south-east of M49. And lastly, to the north-east, I see a somewhat large round fuzzy with a bright core: PCG 41264.